Proper planning and design is essential to ensure that your remodeling project is completed in an efficient manner. From the initial consultation with our clients, to the specific product selection process we can help determine design details that best suit your needs. 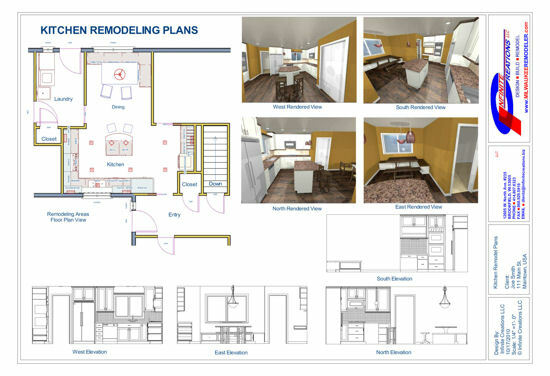 These are all critical steps in the planning and design phases of any remodeling project. Knowing all of this information up front helps keep your remodel on budget and minimizes the worries of hidden costs. Being able to visualize your project before construction begins, ensures the results that you desire. For smaller remodeling projects our Design Services are most often included with our remodeling services. For larger projects, various rates have been established and a full or partial refund of the design retainer fee will be refunded to our clients upon award of contract. We also offer “No Compete” Design Services to Contractors that are in need of Design Drawing assistance. The before photo was taken during an initial consultation with our client. The design challenge involved creating additional living space that would blend in well with existing features of the home. Renderings proved to be instrumental; creating true visions before installation actually began. Our 3D Design Services have been an instrumental tool for our clients, as well as other contractors that are in need of design services. Whether you’re planning a kitchen remodel, bathroom remodel or basement finish, our design services will help you determine a realistic budget for your upcoming project and layout the groundwork for quotes from additional contractors. This way you can be assured you will receive bids that can be compared “Apples to Apples”. Sample Rendering Before, During & After Photo Comparison We provided Design/Build services for this simple closet addition. We can provide full service installations, however to help minimize overall costs to our clients we encourage them to outsource various supplier/installers for additional needs such as carpeting. Visit us on FaceBook to see more recent projects we have completed.